Welcome back friends! I am here with you today to share a masculine card with all of you. I struggle with Masculine cards so with Father's day just yesterday, I thought I would share mine. I am using the Polkadoodles "Sink or Swim" Stamp from LDRS Creative in this card a long with our Splendid Azure 6"x6" Paper Stack. This paper pack is PERFECT for all your masculine cards! For the sentiment I choose to frame it with the beautiful Dewdrop Circle Die Set. This set comes with a large and small medallion style dies. This is the smaller one which is the ideal size for your sentiments. One last close up look of my coloring. I used a lot of stippling to give the animals extra texture. This is one of my favorite coloring techniques. 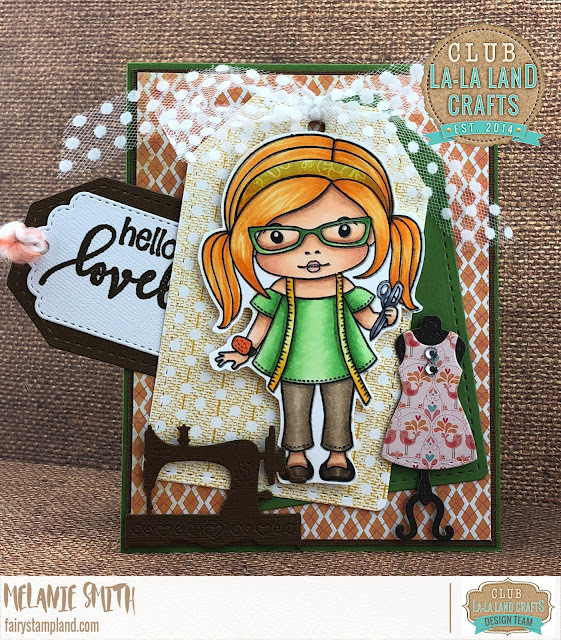 Welcome back to this months La-La Land Crafts monthly Club Kit Reveal. If you're not already a member you are going to WANT to be. This club kit is like no other. We have quality products and are themed together each month to bring you beautiful stamps & dies that coordinate. 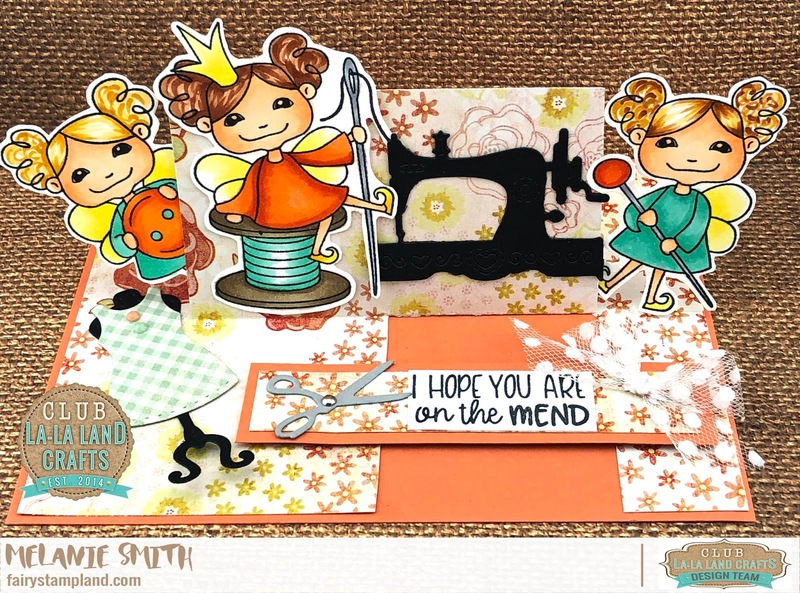 This month our theme is "Sewing!" 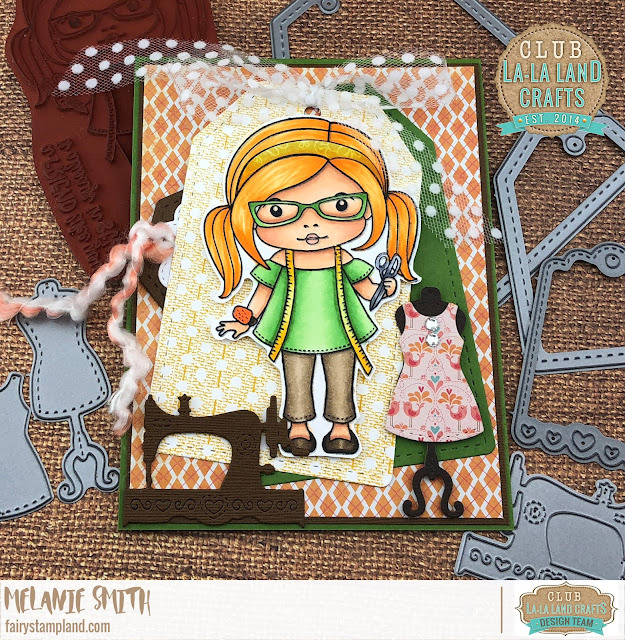 All crafty people know someone who sews, and a lot of them sew themselves so this is a must have kit for all of you. I have two projects to share today along with a YouTube video showing the products up close. 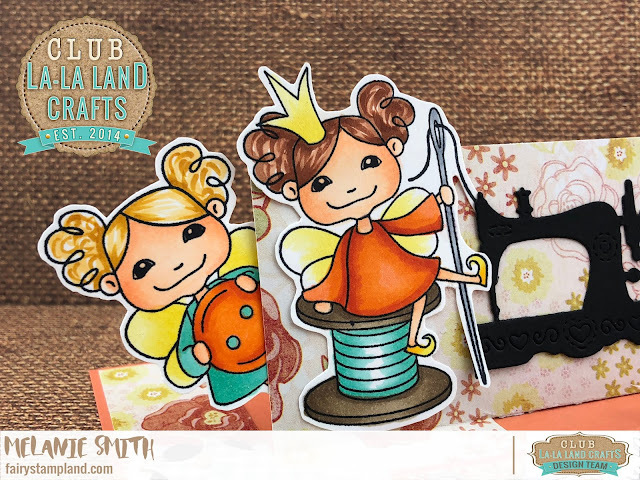 I have used the Sew Amazing stamp set here with the 3 adorable sewing fairies. These little girls were stamped with tuxedo black ink and colored with Copic markers in the following colors. SIGN UP BY JUNE 17 TO RECEIVE THIS EXCLUSIVE KIT! For this second card I have added a couple store items to my kit. 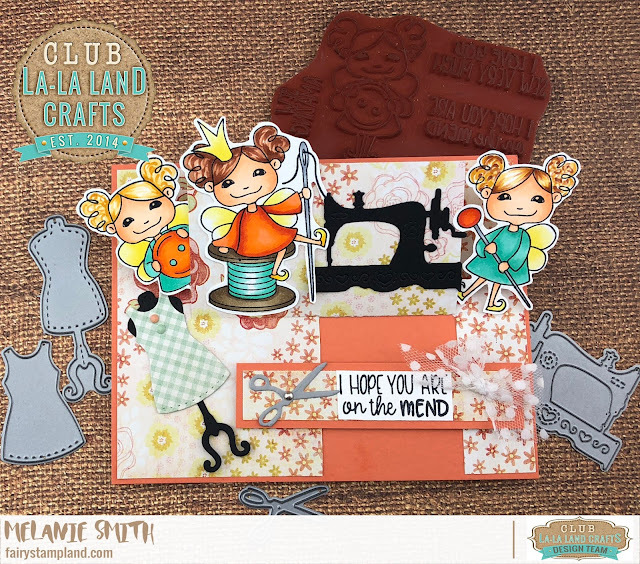 These "extra" items can be purchased in the La-La Land Crafts Online Store. On the other side there is a hidden tag that can be slid out to reveal the "Hello Lovely" sentiment. The dress form and dress as well as the Sewing machine dies come with This Monthly Kit. Would you like to browse the Online Store? If so you can simply CLICK HERE. Feel free to ask any questions you may have about our products. I am more than happy to assist with your purchases. Happy Stamping My Friends & Thank you for stopping by. 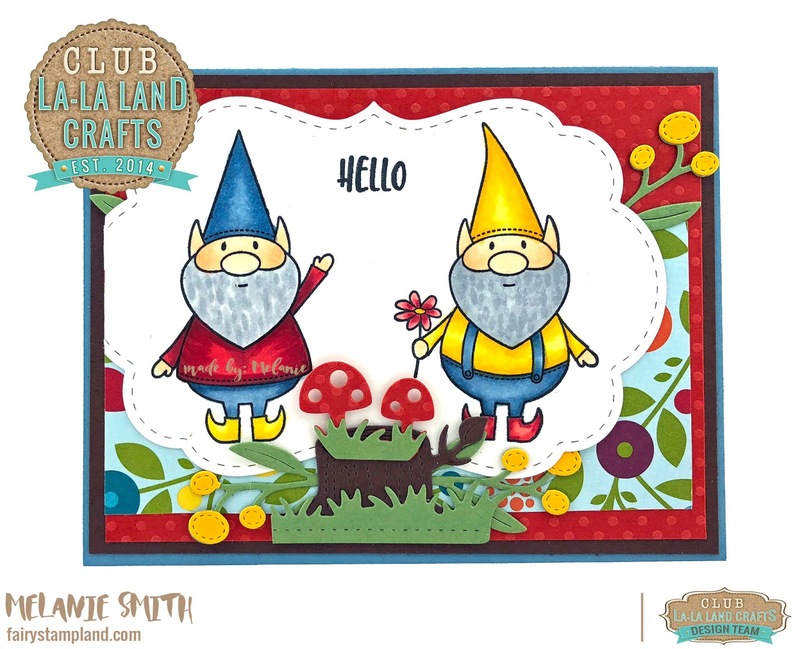 Club La La Land Crafts ~ Gnomes Gnomes and more Gnomes!!!! Today I have some adorable projects to share with you. 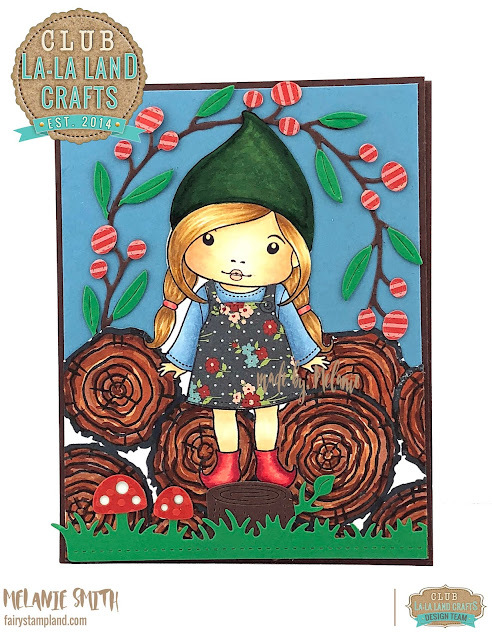 These have been designed for La-La Land Crafts as part of their monthly CLUB design team. 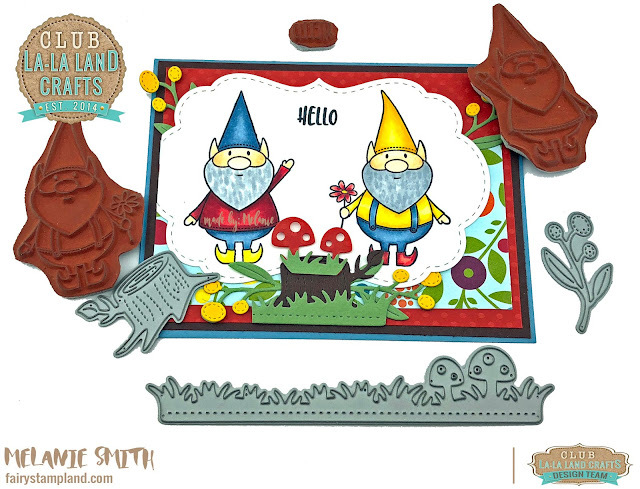 I am in love with these adorable Gnomes. If your reading this and would like to begin receiving these exclusive kits in the mail each month click HERE to subscribe!!! My favorite part of this card is the twig and berries die. I die cut it 3 times for each branch and I cut them apart and pieced them together. I then created a berry arch with them. This little die has SO MANY possibilities. I have done a little masking with Gnome Marci as well. I wanted her standing in front of the stack of logs. If you would like to see more on how to create something similar just drop me a message and I will do a tutorial sometime soon to show you this technique. As you can see by the above picture our stamps are beautiful red rubber cling mount stamps. They stamp perfectly without any hassle. Everything here is from the kit except for the Wood Rings Stamp Set, which I have gotten from the LLLC Online Store. Are they not ADORABLE???? Again I have used the berry branch die cutting it just twice to change the color of the berries. I also cut apart the grass & mushroom border die cuts to create the center piece. 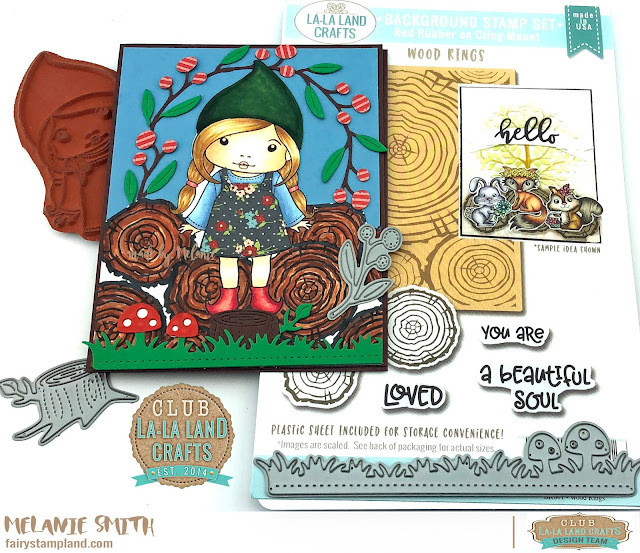 La-La Land Craft's Online Store. These stamp & die kits are Exclusive and will not be available for at least 6 months-1 year after club members receive them. 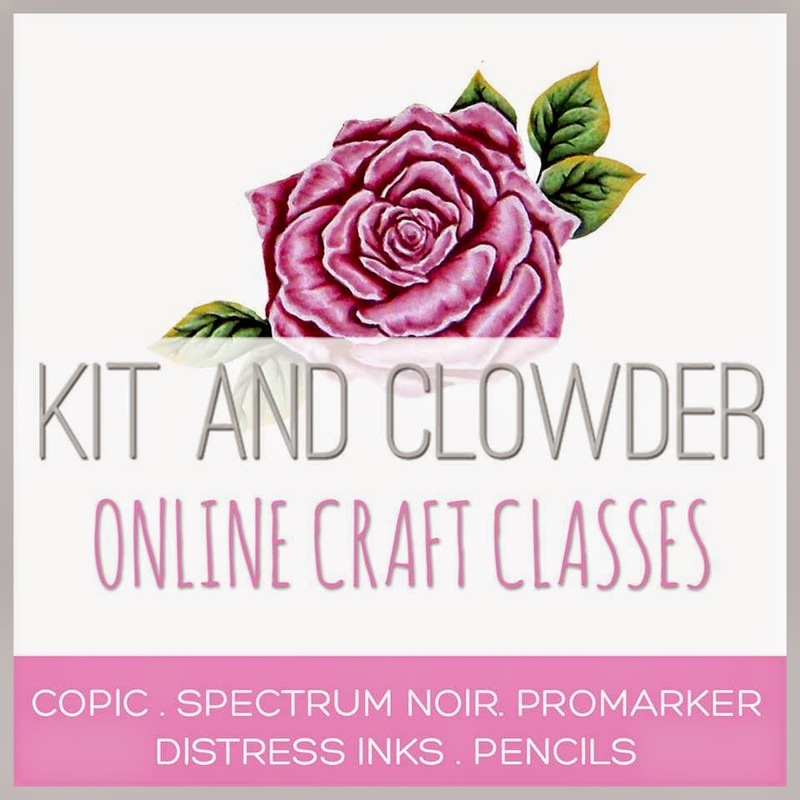 If you JOIN now you should be able to purchase past kits which is a perk of being a monthly subscriber. You also will receive a tutorial by each DT member each and every month. Check back on the 16th of each month to see the new kit!!! Thank you for stopping by today. I have really enjoyed playing with these products this month, but just between you and me.... next months are AMAZING TOO!!! So stay tuned. If you want to be notified when I update my blog simply add your email to the side bar. I usually post about twice a week so not to worry I won't be stalking your email box. Empowering women with Little Darling's Girl Power 1 Stamp & Die Set! I am here with you today to share a fun little card perfect for any strong women! 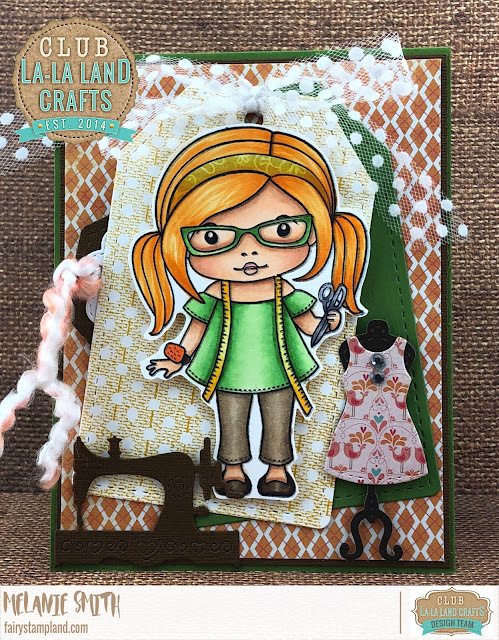 This "Girl Power 1" stamp and die set is perfect for empowering women! I chose to use my Misti Stamping Platform to evenly line up my corner stamps. See photo below. Here I have stamped the top left hand corner of my 4" x 5.25" white card stock. Then once I am happy with the stamping I simply rotated the paper to stamp other opposite corner. Super EASY! To stamp the images I have used the Girl Power 1 Stamp and Die set, along with LDRS Creative New Hybrid Ink in Raven. This ink is amazing. You can use it for almost anything and it stamps so dark and crisp. After stamping my corner images I colored in the floral and vines with my Alcohol markers. Above is a close up of some of my coloring. Can't get that much more perfect than that can you? I love the quality of our dies!!! One last look..... I hope I have gotten your juices flowing and your ready to create something empowering! If you would like to follow my work more closely feel free to leave your email address in the side bar to receive a couple emails per week when I upload new projects. 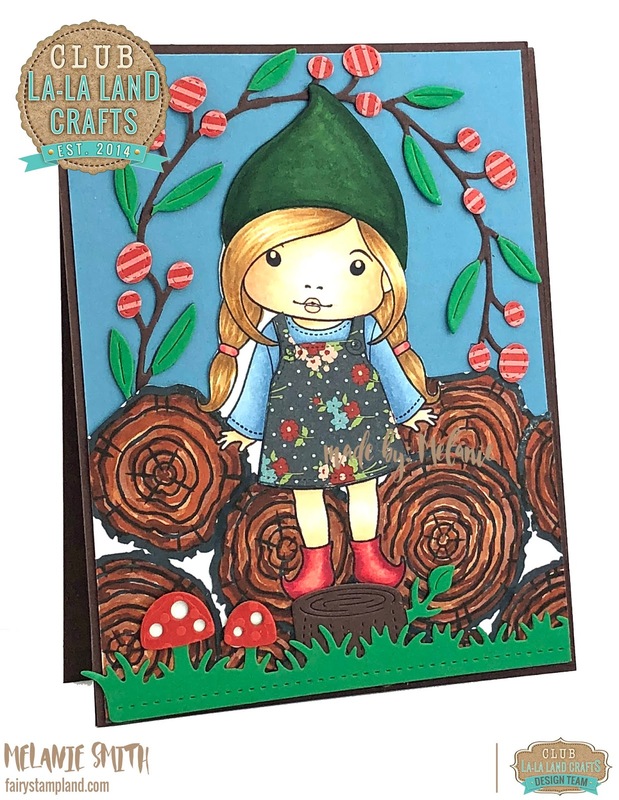 Thank you for stopping by and Happy Stamping!